One of the things that really caught my attention while watching this movie is how human beings seem to have the same conversations, arguments, misunderstandings, passions, political differences, and family squabbles no matter where they are in the world. Deepak Rauniyar brilliantly crafts a story about people on a very basic level and from a very specific perspective. In less than an hour and a half, he weaves together topics of love, war, politics, family, and culture while holding it all together with an emotional and tension-filled narrative that is so rewarding to watch unfold. Dayahang Rai plays the lead role, a man returning home to bury his father, with a lot of restraint and resolve which highlights how much his character has gone through in life. No matter what he is faced with, he just takes the next step towards what he feels is the right thing to do even if it upsets his family and community. Looking up and down the cast, the main strength is in their believability as a group of people who's families have lived, struggled, and survived together through so many hardships over many generations. 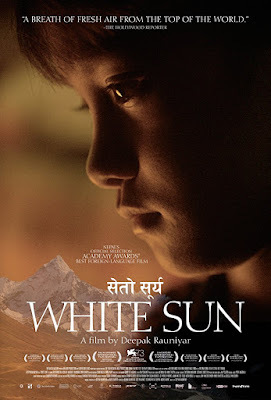 White Sun is an impressive piece of film making that felt oddly relatable even though it was set in a country half way around the world. White Sun is available to purchase through both Amazon and Apple.